These polishes literally came throught my post box about two hours ago, but as soon as I ripped the packaging open I had to blog about them. 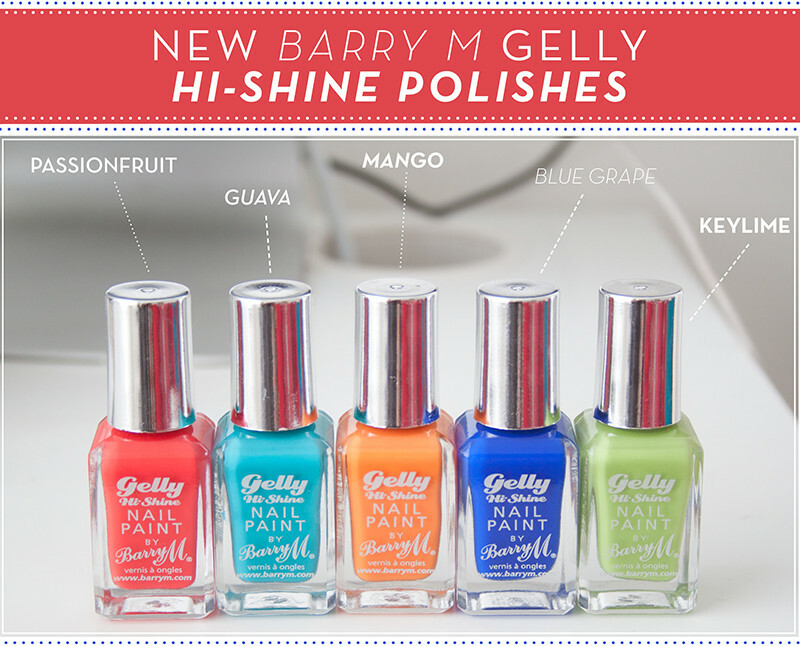 Today I'll be sharing the newest summer 2013 launches from the Barry M Gelly Hi-Shine Range. The Barry M Gelly Hi-Shine range is possibly my favourite drugstore nail polish range and has really put Barry M back at the top of the drugstore nail game. The Gelly Hi-Shine range is long lasting, super shiney and really easy to apply, I've swatched and reviewed them before on the blog (reviews here & here) and thought I'd share the new launches ASAP. For summer they have expanded the super popular line with a launch inspired by summer fruits! A range of perfect summer and beach ready shades perfect for holidays. 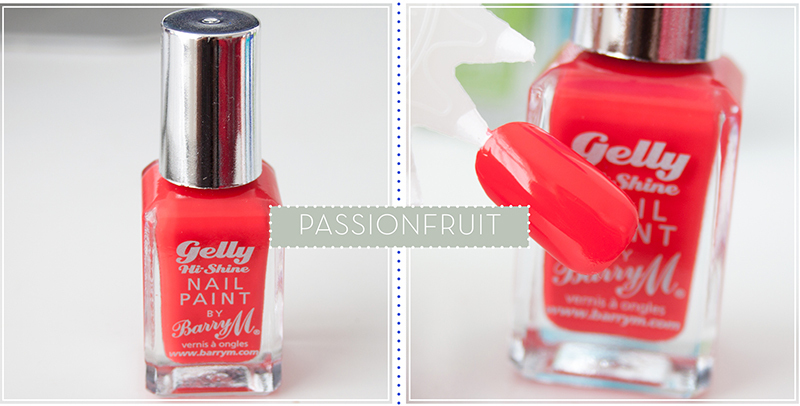 Passionfruit is a beautiful bright suped up coral red. 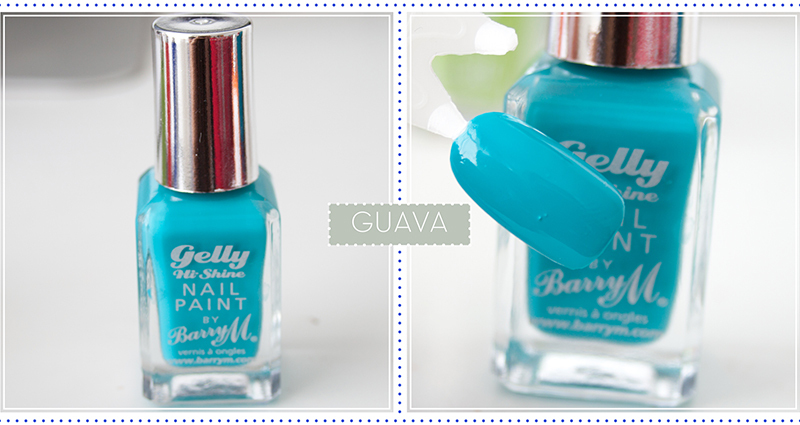 Guava is a beautiful lagoon turquoise blue shade. 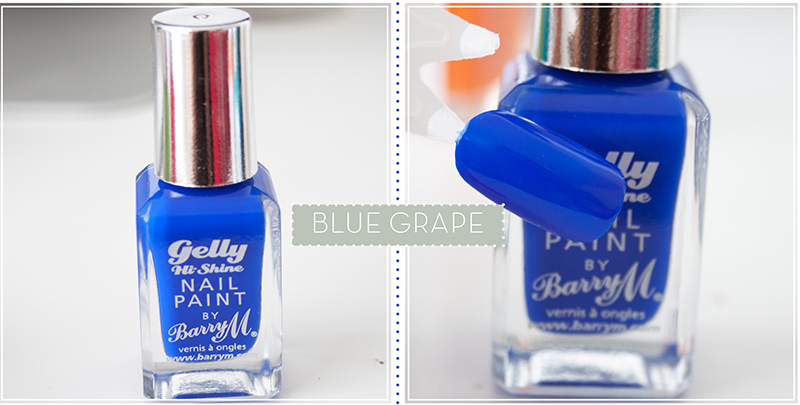 It reminds me of the sea in the hot weather and definitely a perfect holiday ready shade. 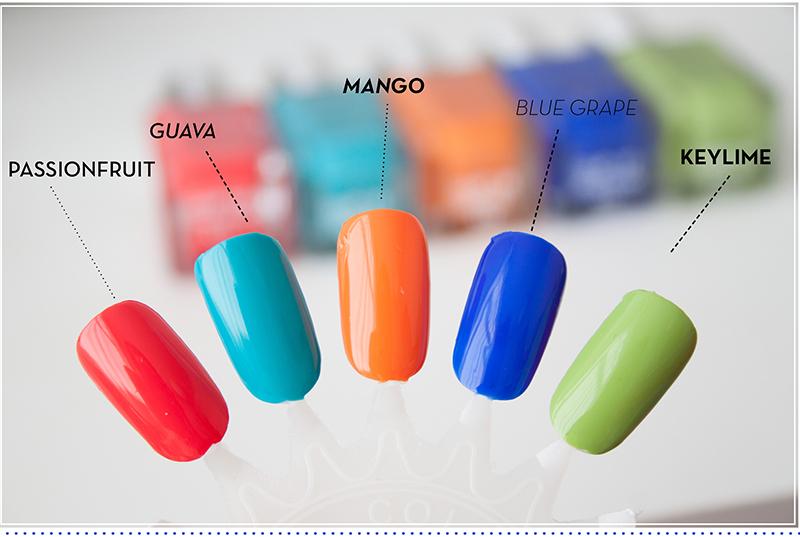 Mango is a bright orange.. Blue Grape is a bright combat blue which looks very similar to Nails Inc Baker Street (One of Beyonce's faves apparently!) Key Lime is a slightly subdued bright mustardy-green, its not as bright as other shades in this range but it's a very pretty creamy lime-yellow. It's very similar to Estee Lauder Absinthe but with a much more reasonable price tag. 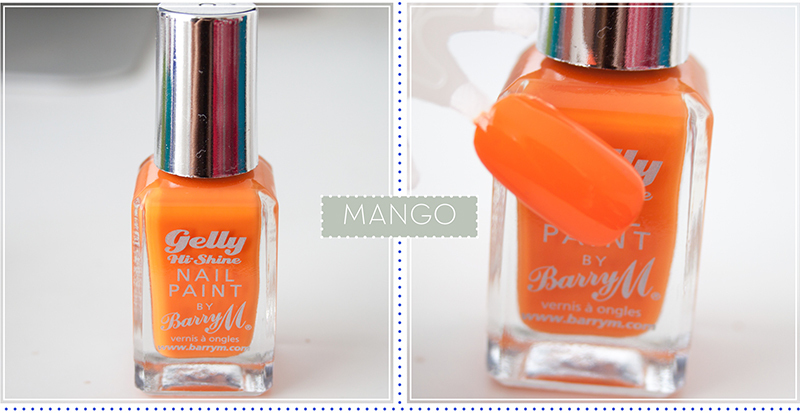 I find the Barry M Gelly polishes to apply easily and most are opaque in just one coat. All the ones swatched above are opaque in one coat apart from Mango which needs a extra one. Yellow's and Oranges always tend to be a bit streaky in my experience! They have a very high shine gel inspired finished and lasts a good 5 days on my nails before noticably chippig. At £3.99 each and launching in Superdrug June 5th & Boots June 12th these are absolute summer must haves. 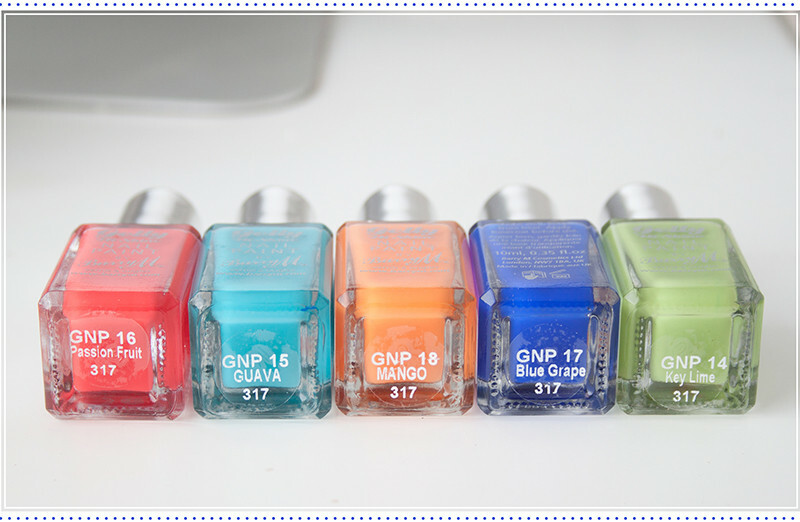 My personal favourites are Guava and Blue Grape as I think both would look absolutely stunning with a tan.